Najib 'a problem', Mahathir no solution! The former Prime Minister wants Malaysia to be governed in the mould that he created. 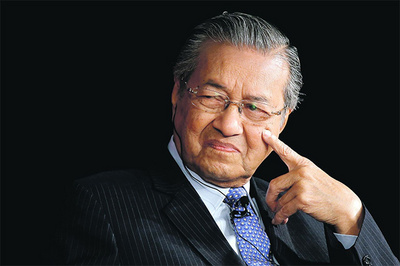 If we read former Prime Minister Mahathir Mohamad correctly, he’s against Prime Minister Najib Abdul Razak because the latter has so far not answered several questions about his scandal-ridden administration. He wants Najib to step down given the failure, in his eyes, to answer these questions. Mahathir has, ironically for one who ran a tainted administration for 22 years when he was Prime Minister (1981-2003), seized the moral high ground on Najib but not so accurately. Mahathir is also harping on Najib's alleged sins -- Altantuya etc -- to get him out. Obviously, he cannot be too pleased either with the foreign textbook experts and the foreign PR people surrounding Najib and antagonizing senior government servants. The right thing for Najib to do, under the circumstances, is to go on leave, pending investigations into the numerous allegations. The former Prime Minister has not touched on this approach. All he fears is that the scandal-ridden Najib will lead the ruling Barisan Nasional (BN) to defeat come 2018 in the 14th General Elections. However, if Najib leaves now and makes way for a new Prime Minister, Mahathir thinks that the BN will still have time to “put things right” just in case Pakatan Rakyat (PR) seizes the reins of power in Putrajaya. Mahathir fears that when BN is eventually defeated, the new government will interpret that procedures in awarding contracts must also be fair. That means that many BN leaders will be carted off to jail for nepotism, conflict of interest and abuse of power which had resulted in corruption, illicit money flows, money laundering and acting as a damper on the value of the ringgit. Since Najib was not following the procedures that Mahathir established and is simply doing just what he likes, the former Prime Minister wants the present Prime Minister to do the disappearing act. Just like that? No need to be held accountable? What about public accountability on the RM27 billion 1MDB monies that Mahathir estimates is missing and which he presumes has been lost either as a result of corruption or theft? Who stole? Who was corrupt? Najib must also explain how 1MDB has chalked up debts of RM42 billion within five years. However, Mahathir has already said that he really couldn’t be bothered about Najib's lifestyle. He also refuses to work with the Opposition. It’s by no means certain that BN, under Najib or whoever replaces him, can be defeated in 2018. The people have already lost their sovereignty i.e. the BN cannot be overthrown through elections since a handful in power have hijacked the sovereignty of the people. BN can still secure 112 seats in Parliament with as little as 18.9 per cent of the votes counted. There are many tiny seats like Putrajaya, 15000 voters, which are Umno strongholds. Umno only needs 7,501 votes in Putrajaya, for example, to win assuming a 100 per cent turnout. What Mahathir expects, in making the "it can be lonely telling the truth, I know that I am alone", remarks was for Umno divisional chiefs, warlords, veterans and the Umno Supreme Council to send a delegation, headed by Deputy Prime Minister Muhyiddin Yassin, to see Najib and tell him to step down. He hopes that they fear that Umno will be affected if Najib doesn't go and he (Mahathir) keeps attacking. If the above happens, Najib may go albeit grudgingly, unless he calls for snap elections. Najib had also said once in London, before GE13, that he can always do what his father did i.e. declare a state of emergency, suspend Parliament and rule by decree. But he said he won't do it. It's strange that Najib should even think about what his father did and see it as an option. Did he think that 2013 was 1969? Secondly, Mahathir may be trying to buy political protection for his son Mukhriz who is Kedah Menteri Besar and his son Mokzhani who is in business. Thirdly, he's trying to mask the loss of sovereignty issue by claiming that BN can be defeated at the ballot box. That, he thinks, will scare the Malays into uniting behind Umno while allowing the Opposition to indulge in wishful thinking and live on hope. Many people, including Mahathir, think that he's not petty and is more concerned about the big picture. That’s very much in doubt. He has already said that Malaysia will be like Singapore if Pakatan Rakyat seizes the reins of power in Putrajaya. Singapore is about meritocracy and sustainability. Najib has pledged that the 11th Malaysia Plan, beginning next year, will be inclusive. That’s anathema to Mahathir who swore by exclusiveness. What Mahathir wants is for Malaysia to continue under Umno with his policies harping on continuing to deny the brightest and the best and unsustainability. What Mahathir fears above all is the Chinese business community because they have the money and access to large amounts of it. He has already said that he's against military rule because the Chinese, at the end of the day, will put the Malay generals in their pockets. The former Prime Minister thinks that Najib has introduced his own brand of unsustainability viz. a feudalistic dynasty. Umno divisional leaders and war lords, as disclosed by Tengku Razaleigh recently, each get RM50, 000 per month and government projects.